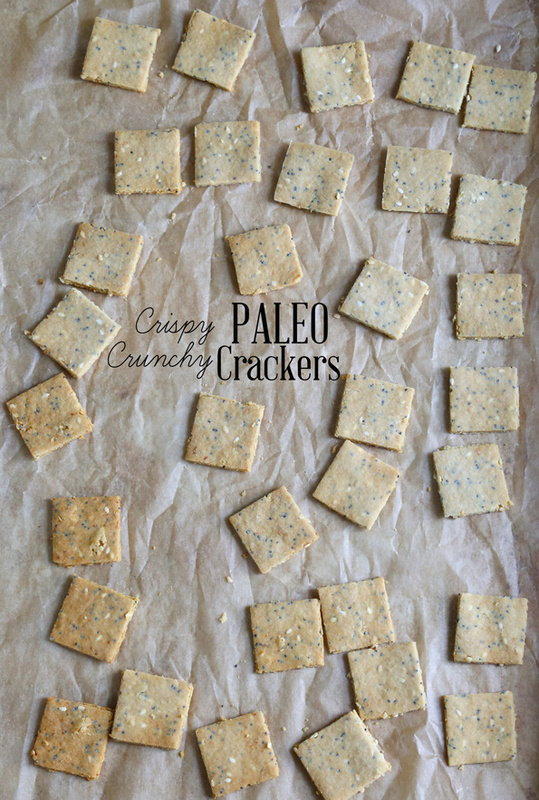 Paleo crackers, made with almond flour and a touch of tapioca flour, baked low and slow, make for a truly crispy, crunchy cracker. Oh, and if you think you’re not interested in Paleo recipes, try to think of them as a whole other category of gluten free recipes that are, by definition, also dairy free. No biggie, right? A few notes about this cracker dough: First off, don’t worry yourself over getting the dough rolled out to exactly 1/8-inch thick. As you’re rolling out the dough, your hands are a more reliable indicator of even dough thickness than your eyes. Run your palms over the dough lightly to judge thicker spots, and then roll those out a bit thinner. Second, to avoid many of those tell-tale “wrinkles” on the dough from rolling with parchment paper, don’t press quite so hard! Even, medium pressure on the rolling pin should do it. Just keep rolling back and forth until the dough is the proper thickness. Finally, as indicated in the recipe directions, you will need to add water by the 1/8 teaspoonful until the dough holds together well. Without the water, the dough will feel moist but will still crumble, due to the oils in the almond flour. You may find that the dough breaks apart into very irregular pieces during rolling. If that happens, the dough just needs a bit more water. Just knead in water, a few drops at a time. 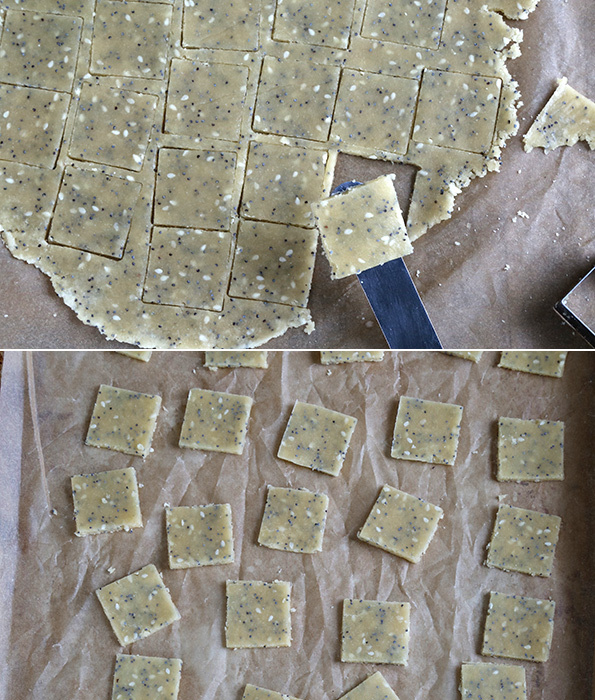 Your cracker squares do not need to be quite so clean. As always, I have to have clean lines and only photo the most gorgeous-looking crackers, or you really just wouldn’t want to make the recipe, right? Do make shapes of relatively uniform size, though, just so the crackers all bake at the same rate. Oh, and if you don’t like the seeds you can of course just leave them out! In a large bowl, place the almond flour, tapioca starch/flour, salt, baking soda and seeds, and whisk to combine well. Create a well in the center of the dry ingredients, add the coconut oil, egg, and 1/8 teaspoon water, and mix until the dough comes together. Knead in more water by the 1/8 teaspoonful until the dough holds together without crumbling. Place the cracker dough between two large sheets of unbleached parchment paper and roll out as close to 1/8-inch thick as possible. To prevent the rolled-out dough from having a crinkled appearance, do not press too hard with the rolling pin. Rather, apply medium pressure and roll back and forth over the dough. Remove the top layer of parchment paper and cut out shapes that are approximately 1 1/4-inch square using a cookie cutter, pizza or pastry wheel, or sharp knife. Lift the shapes off the parchment with an offset spatula or knife, and place about 1/2-inch apart on the prepared baking sheet. Place in the center of the preheated oven and bake until lightly golden brown all over and dry to the touch, about 15 minutes. Allow to cool completely on the baking sheet. Store in a sealed glass container (not plastic!) at room temperature to maintain crispness. Use a pizza cutter to cut the dough. You don’t waste any like that and you don’t have to reroll it to use the scrapes. Nicole, these are lovely! 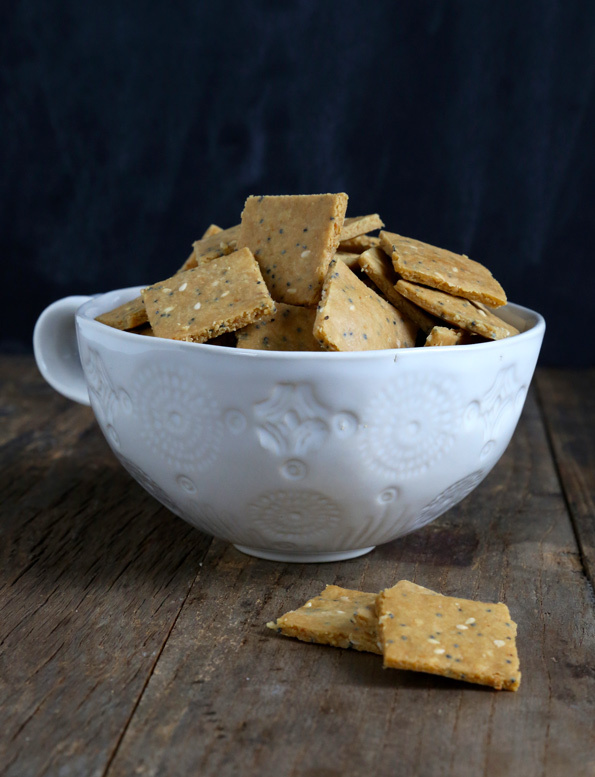 I’ve been really craving some kind of “multi-grain” hearty snack crackers recently. These are definitely going on my Try It Soon list. Thank you for the effort you put into getting your photogenically uniform edges and showing us what a gorgeous cracker can be…and I love that you take a very practical and approachable next-door neighbor tone and remind us that they don’t have to be as gorgeous as yours to taste good! You’re great at making your recipes doable for the home baker. My kids like those, too, Jennifer. I have to say that a lot of boxed GF crackers are nasty. I don’t blame them for needing cheese dust to get them down. I will definitely be making these!!!! I do have a pastry cutter, but I find my pizza cutter does a much better job on the wheat thin style crackers. I’m sure it’s up for the job here!